Mornings are stressful enough without having to worry about eating breakfast. And that’s why many people’s go-to is something quick and unhealthy. You know, greasy microwavable biscuits, drive-thru donuts, and the like. 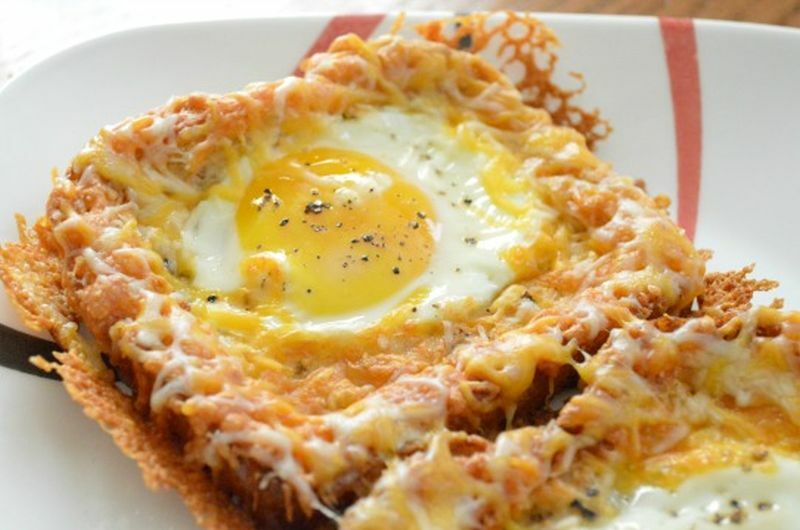 Well, these 20 quick breakfast ideas prove that there’s a better way. You don’t have to sacrifice time for nutrition (or vice versa!). Some are make-ahead recipes, which means you can prep them the night before, and others are so easy to make that they’re ready to go before you’ve even gotten your coffee. Many are also high in protein and fiber, which will help you stay fuller and have more energy throughout the day. So, give these ideas a go and say goodbye to early-morning heartburn and mid-morning crashes. Quinoa isn’t just for side dishes and salads. 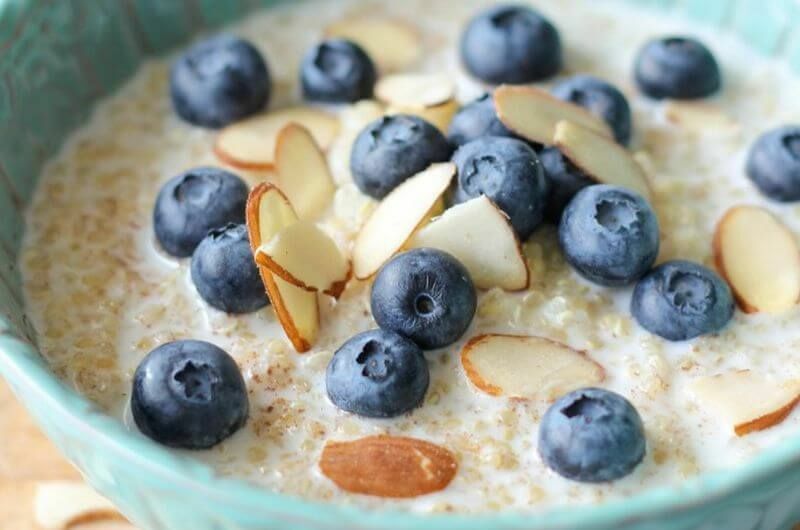 This healthy breakfast swaps out the oats or other grains for quinoa, and the result is a cold porridge. If you’re one to let your cereal sit in the milk and soak it up, then you’ll enjoy this bowl of quinoa. For a crunchier version, try puffed quinoa in this recipe instead, which can be bought in stores or made at home. If you love toast and eggs, this baked version is a must-try. It’s similar to eggs in a basket – the quick breakfast where eggs are cooked in the middle of a piece of bread – only you don’t have to stand at the stove. Rather than cut out a hole, for this the bread is pushed down with a spoon to make space for the baked egg. Then sprinkle on cheese and seasonings, and breakfast will be out of the oven in about ten minutes. 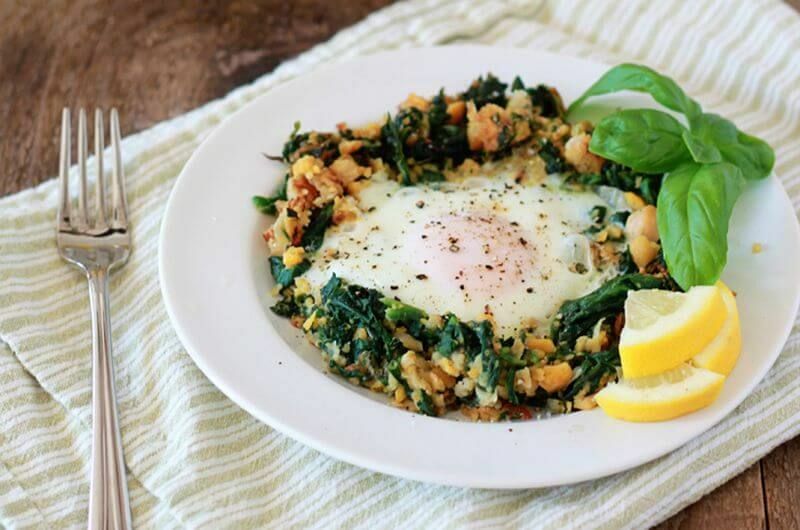 This might look like a special breakfast, yet it’s easy to make in under 15 minutes with a can of chickpeas, an egg, and some spinach. Once the greens are wilted, add chickpeas to the pan, and lightly mash with a fork. Make a circle with space to crack the egg into the middle, and when the whites are cooked through, transfer everything to a plate. To reduce the fat, simply use less oil, like with an olive oil cooking spray. 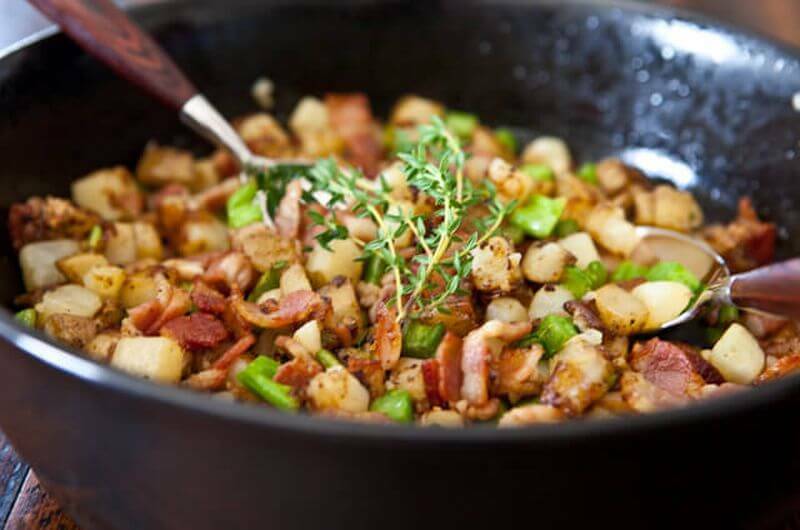 Instead of a quick breakfast hash made with just potatoes, why not add other veggies like broccoli to the mix? Then you’re getting more flavor, reducing the calories, and adding nutrition. Whereas potatoes mostly just offer vitamin C and potassium, a superfood like broccoli has all that, as well as a wide variety of other micronutrients too. 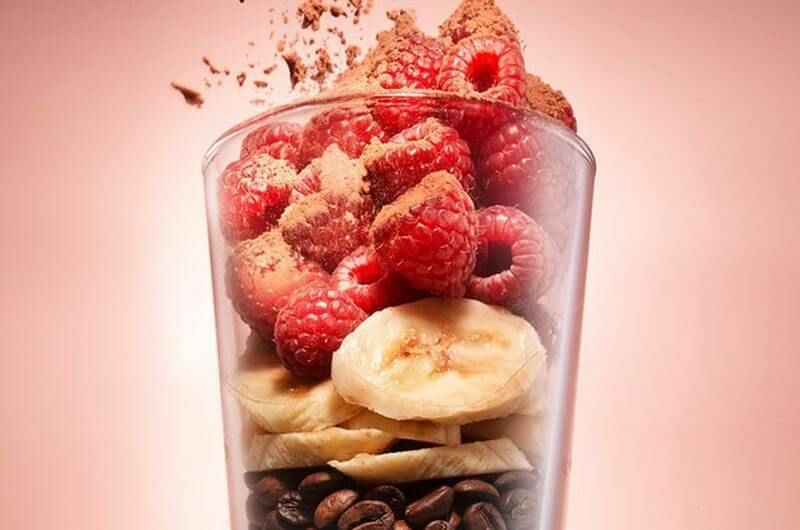 If you’re going to have a smoothie for breakfast, why not add coffee? That way you’re getting two in one for the ultimate morning convenience. Put everything in a blender, and you can have a balanced breakfast, tons of protein, and caffeine ready in minutes. If you prefer to leave out the raspberries, use a large frozen banana instead. 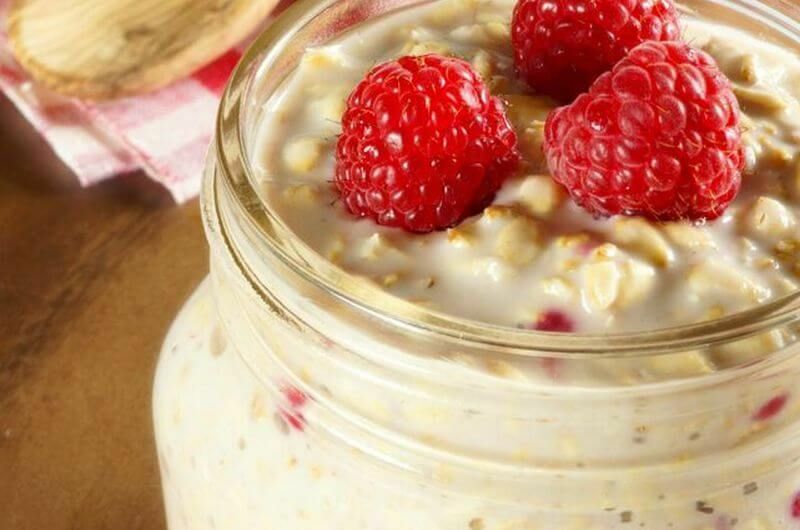 Make overnight oats, and there are two ways to enjoy it. Based on how you feel in the morning, or what the weather is like the next day, you can eat it as is from the fridge or warm the oatmeal up. 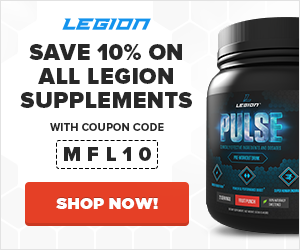 It’s an easy recipe to adapt too, depending on the fresh fruit and flavor of whey protein you want to use. This is a great Sunday breakfast because it’s easy to cook, and then you’ll have leftovers to eat on busy mornings. 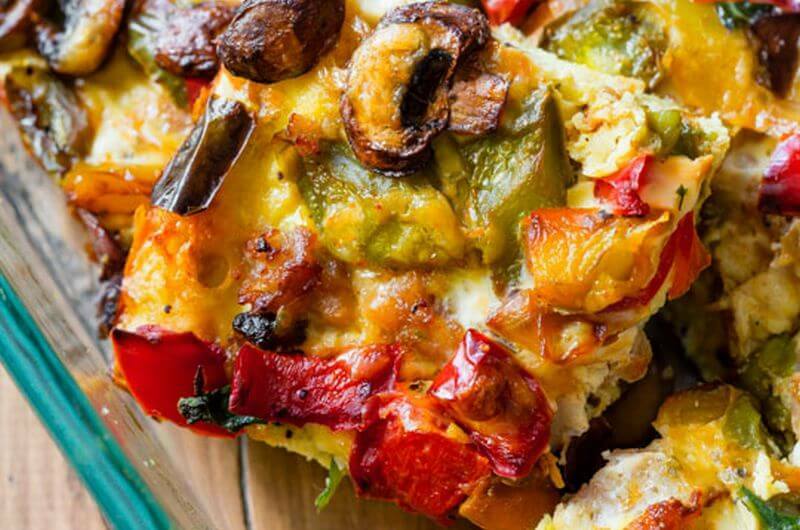 It’s also got enough going on – sausage, peppers, mushrooms, and cheese – that you won’t get tired of having this casserole throughout the week. 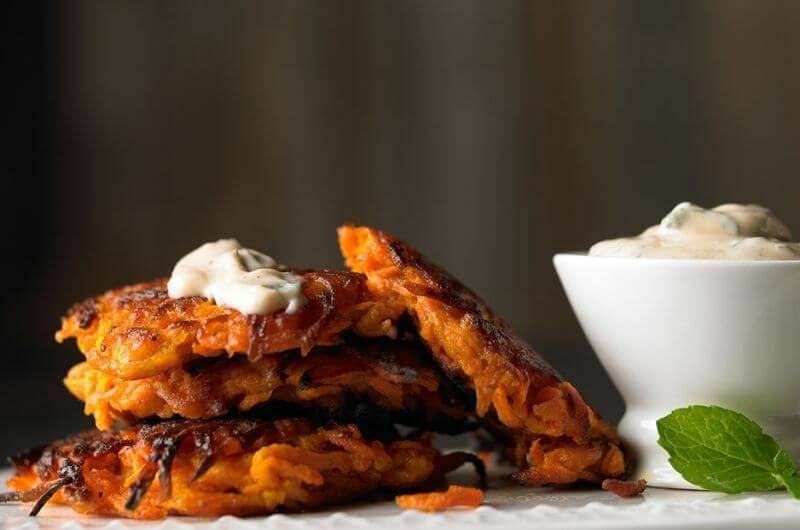 These latkes are easy to make. Since they’re baked and not fried, most of the work is just in grating the potatoes – or in this case, sweet potatoes. Enjoy them with a spoonful of applesauce, dollop of sour cream, or maple-flavored Greek yogurt. Baking a lot of eggs for breakfast can take up to an hour, yet it’s possible to make a 5-minute quiche. Yes, you can cook eggs in the microwave, and they’ll still be fluffy with a touch of milk and cheese. 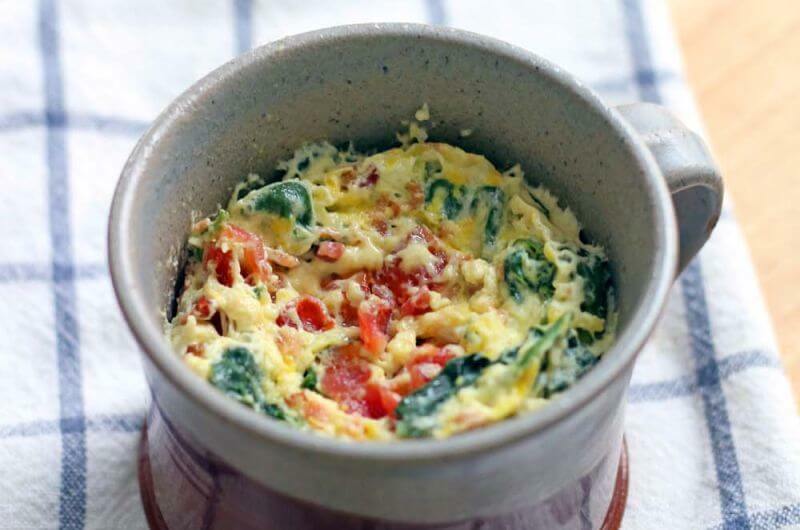 This crustless quiche in a cup is also a great way to use up leftovers like diced bell pepper or sautéed mushrooms, so feel free to mix in whatever you have in the fridge. This is an easy way to make eggs into a complete breakfast, whether you want to prepare them in advance or whisk them together in the morning. 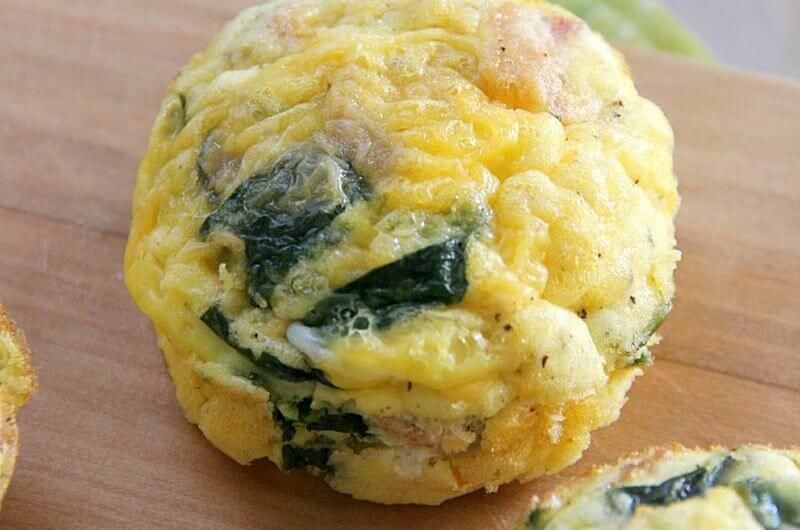 Egg muffins only take ten minutes to make, then twenty minutes in the oven. This recipe uses bacon, spinach, and cheese, but you can add any mix-ins you’d enjoy in scrambled eggs. Can’t decide between oatmeal or yogurt? 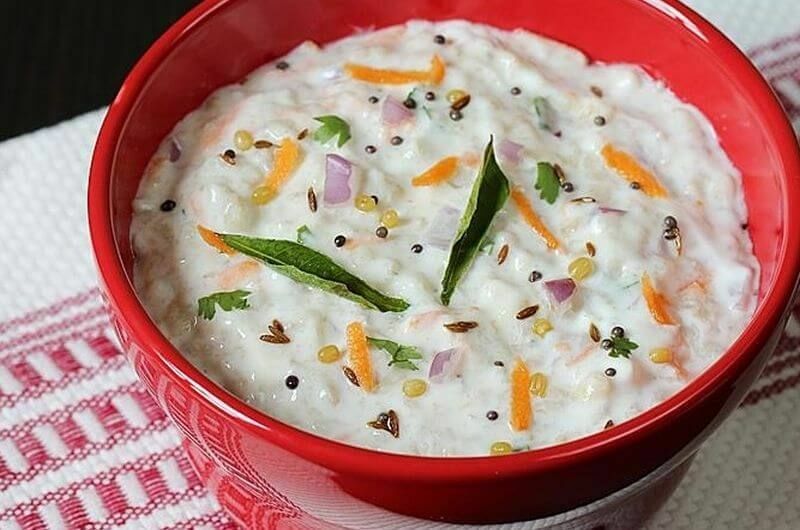 Try this quick Indian breakfast from scratch. 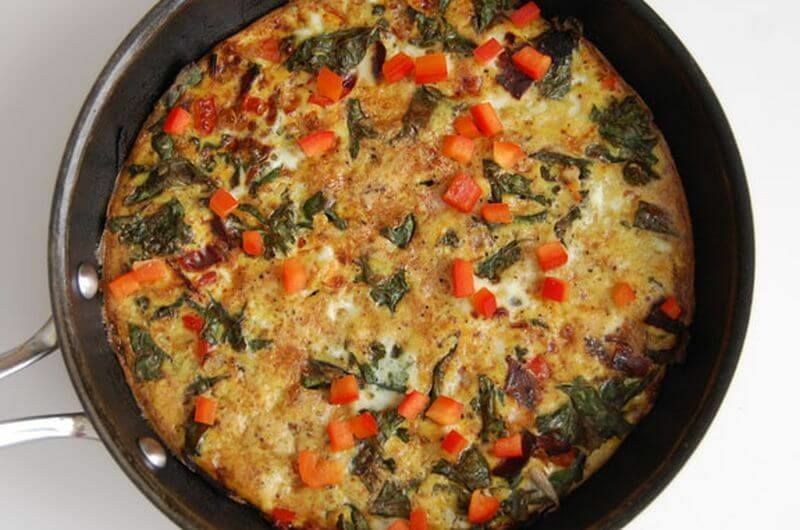 It’s savory with mustard, cumin, and even fresh chilies if you want to start your day with a spicy breakfast. Add raw onion, if you like the strong flavor, or serve with chutney like garlic-tamarind, cilantro, or mango pickle. This quick paleo breakfast starts in a skillet, just until the eggs start to set, and then you can finish it in the oven. That method means, while your food is cooking, there’s time to sneak away and get ready for the day. Or you can get in a fast interval workout before wolfing down these veggies and eggs. Set up breakfast in a slow cooker, and you won’t have to worry about anything in the morning – except maybe pushing the button on the coffeemaker. This one has carrots and zucchini for a sweet oatmeal, or you can use fruit like grated apples and sliced bananas. Need something you can grab as you head out the door? 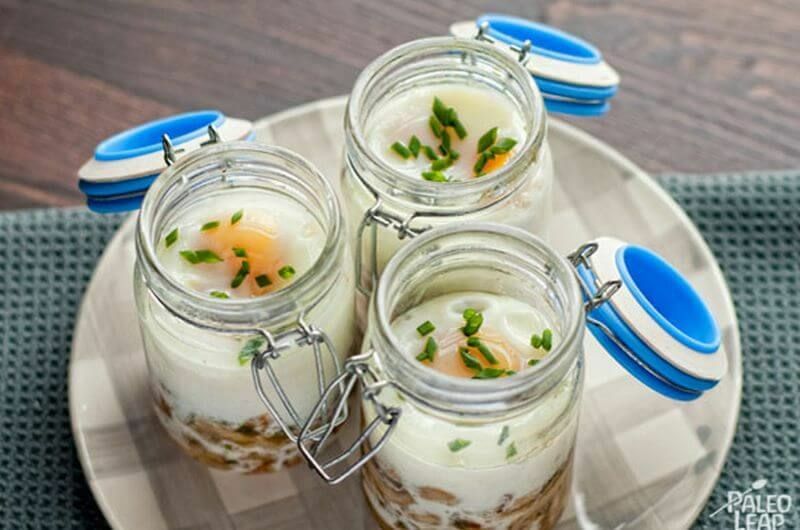 Most egg dishes aren’t great for breakfast on the go, but when you cook them in a jar, they’re already in a portable container. That will even fit in a cup holder so you can sneak bites at red lights on your way to work. Once you try this quick recipe, you’ll never let an avocado become overripe again. 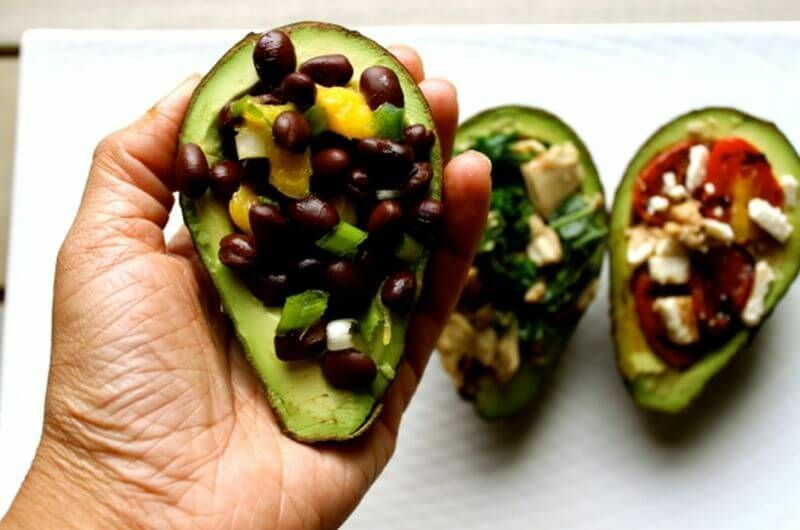 Remove the pit, and you can turn half an avocado into a bowl, then fill it with other delicious ingredients to make a whole meal. This one has a black bean and mango salsa that’s ready in minutes. Add shredded chicken or scrambled eggs for extra protein. 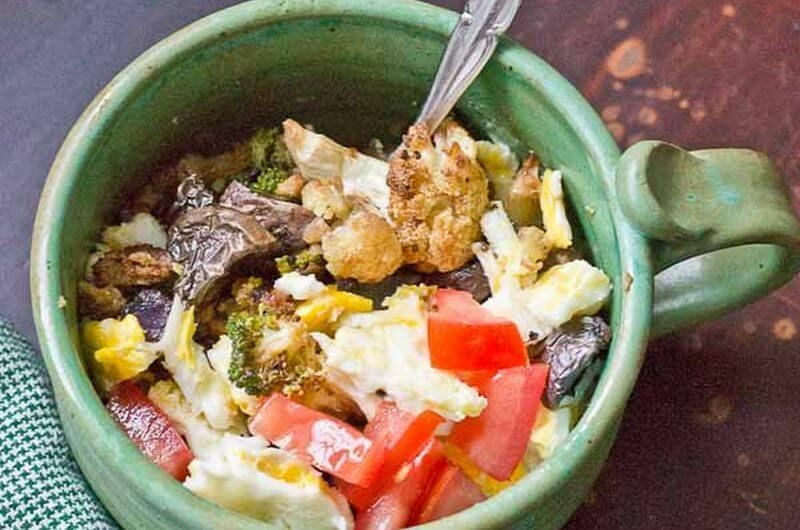 Use leftover roasted peppers, onions, or broccoli for this quick veggie breakfast. And you can add a sausage patty, or a vegetarian option like Morningstar Farms, depending on what’s better for your meal plan. Veggie sausage is low in fat and has wheat, soy, and egg protein for a fast, healthy breakfast. Most quick breakfast bowls with yogurt have different kinds of fresh fruit and granola. 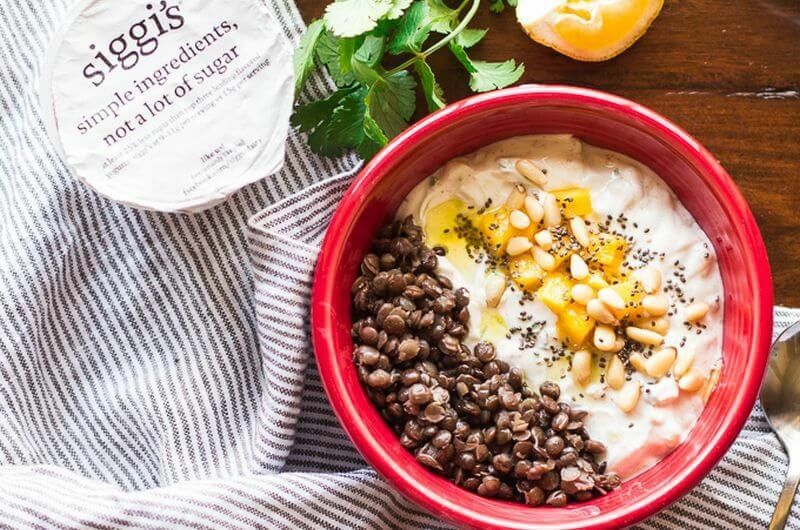 But you can make plain yogurt into an awesome savory breakfast too. This one has lentils, cucumber, and pine nuts for a healthy meal that’s good any time of day. And like other yogurt parfaits, it’s easy to take to-go. You don’t have to think big to eat a hearty breakfast. 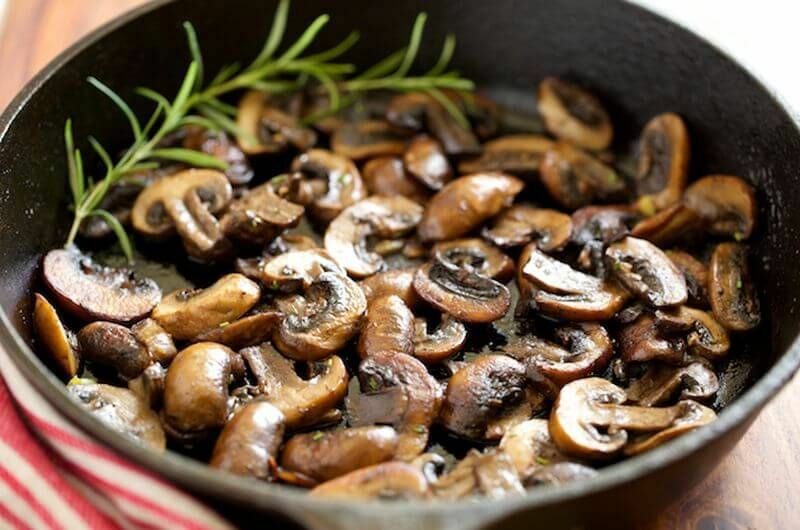 Sauté these up real quick, and serve with scrambled eggs and hot sauce to make mushroom breakfast tacos. Or use them to top avocado toast or savory pancakes. 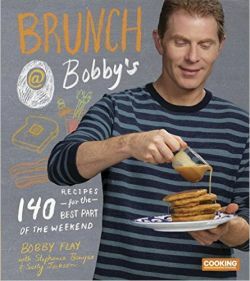 Find more recipes to build your perfect morning meal in Brunch at Bobby’s: 140 Recipes for the Best Part of the Weekend. Muffins are the ultimate make-ahead breakfast, especially since they have way better nutrition when baked at home. 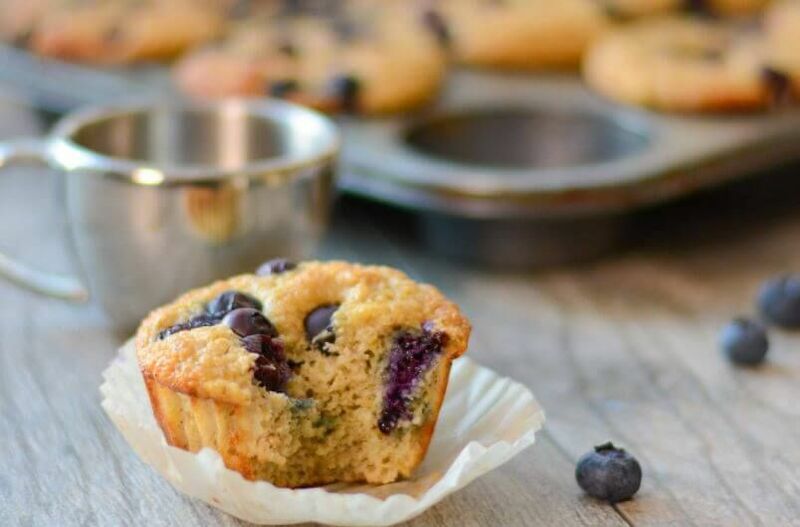 Each one of these blueberry muffins has almost 10 grams of protein apiece. 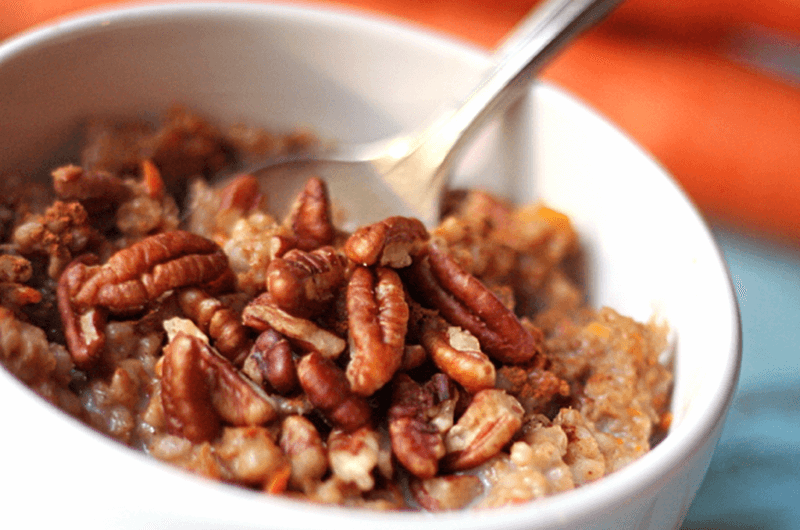 Mix in some walnuts, or sprinkle slivered almonds on top, and that will bump up the protein even higher. One of the best things about homemade breakfast burritos is that you can make them ahead of time. They’ll keep in the fridge or freezer, then can be reheated any number of ways. These are loaded with vegetables for a healthy burrito. And although they have over 20 grams of protein apiece, this is a quick vegan breakfast made with tofu and mushrooms. 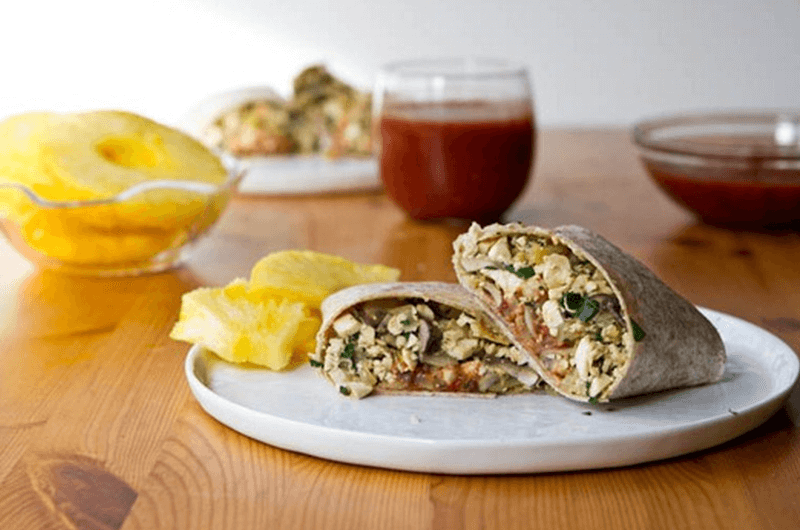 What did you think of these quick breakfast ideas? Have anything else to share? Let me know in the comments below!